Restaurants are establishments that are typically dedicated to the selling of edible food items to customers as their main source of income. It is often a good means of gaining income depending mostly on the quality of the food being sold as well as the preferences of the surrounding demography. Restaurants are also a place of social gathering or interaction depending on the theme of the restaurant. You may also see receipt samples. 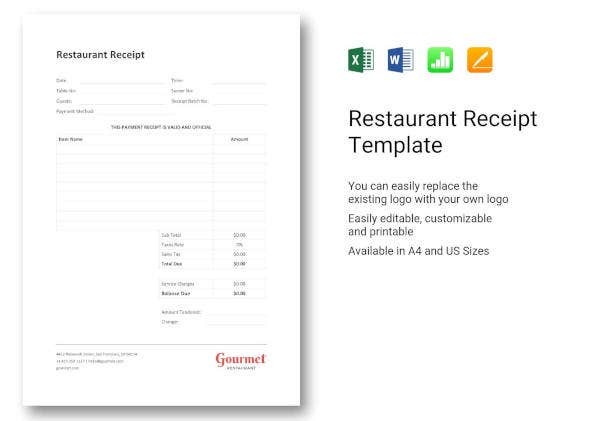 Restaurants today see the need to itemize every purchase invoice or transaction made by a customer in order to be able to estimate the total cost or how much the customer must pay to the restaurant. It is also used to list down what expenses the customer has in order to avoid conflict about what the customer purchased. 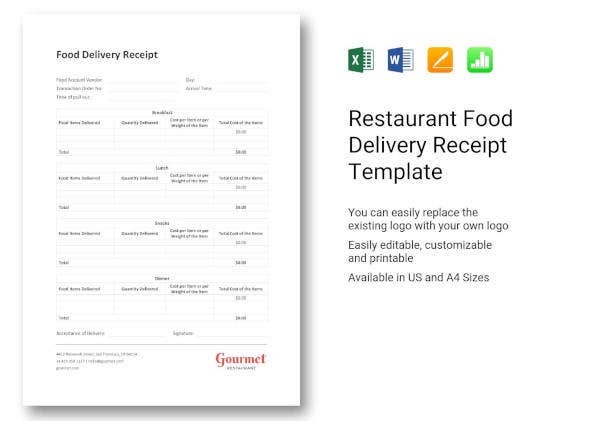 As you will be reading through this article, you will be introduced to a variety of different examples of a restaurant receipt template that you may use for your own restaurant. This will be helpful in confirming the legitimacy of a receipt. 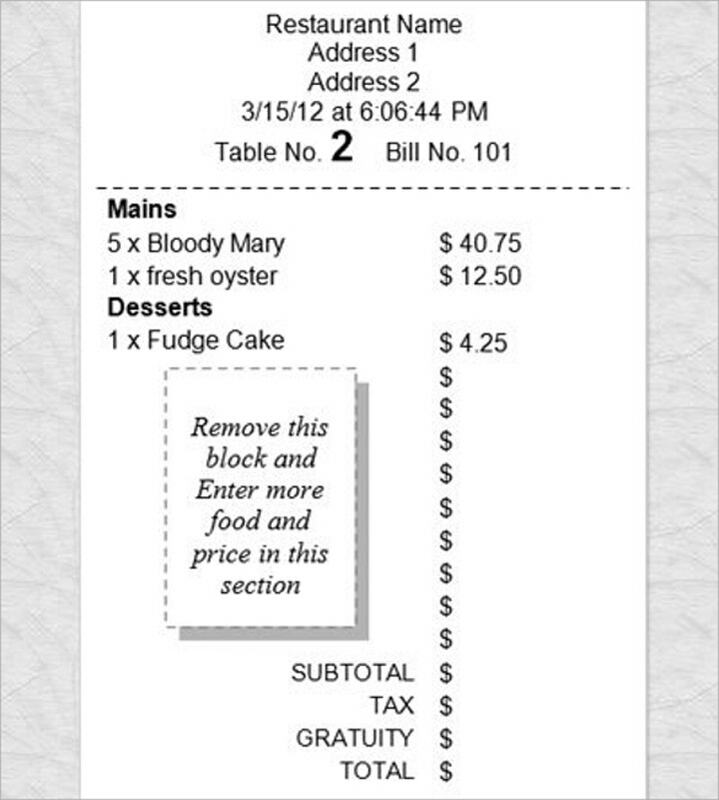 This restaurant receipt template is a good example of a receipt that is appealing to the eyes. This template’s design comes from the idea that the combination of using bright colors and simple images will make the customer feel entertained. This makes the customer feel amused or happy enough which can leads to restaurant workers receiving extra tips. 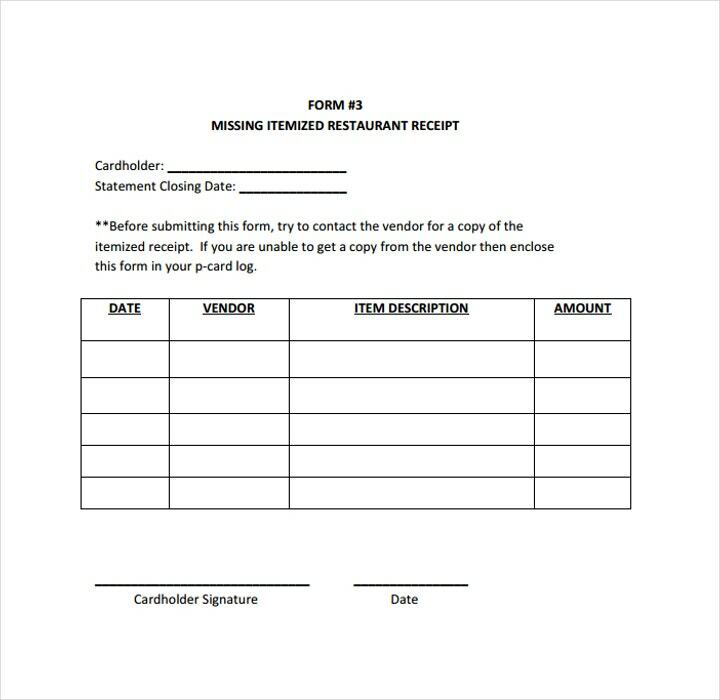 It is important to have a receipt not only for when you are running a restaurant business but for any form of transaction that will require you to catalog all of the items involved in the transaction. This is because the primary purpose of a receipt is to display a list of items and their cost to the buyer. 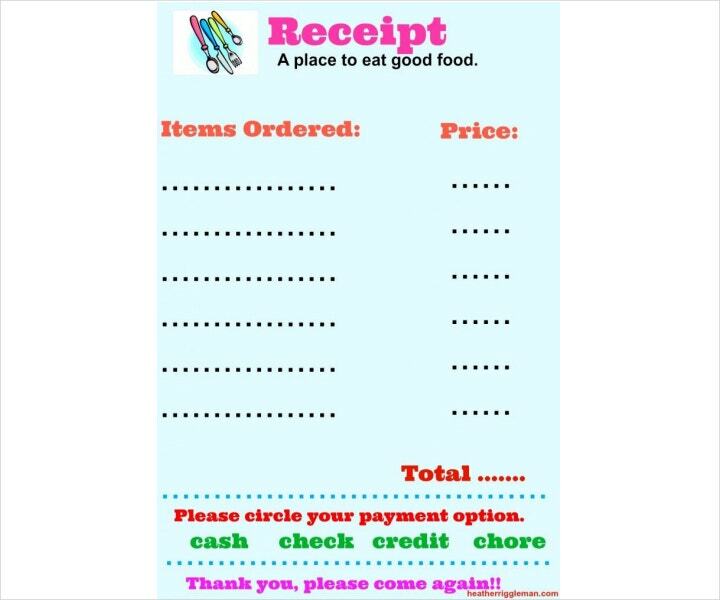 Receipts are documents that allow establishments to catalog any and all transactions made between the buyer and seller. In some cases, these may act as a proof of purchase receipt. 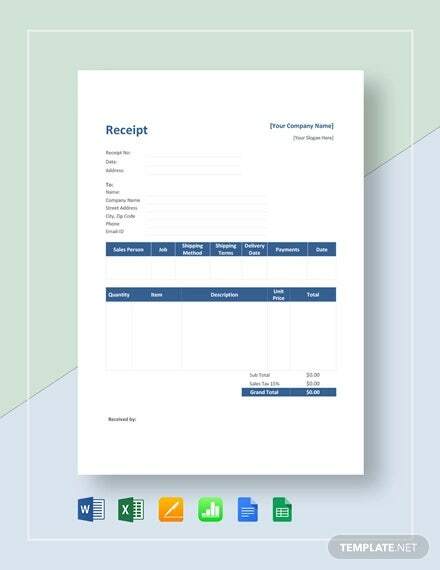 There are a variety of receipt templates available for every form of transaction and each one is specially tailored for that specific transaction. 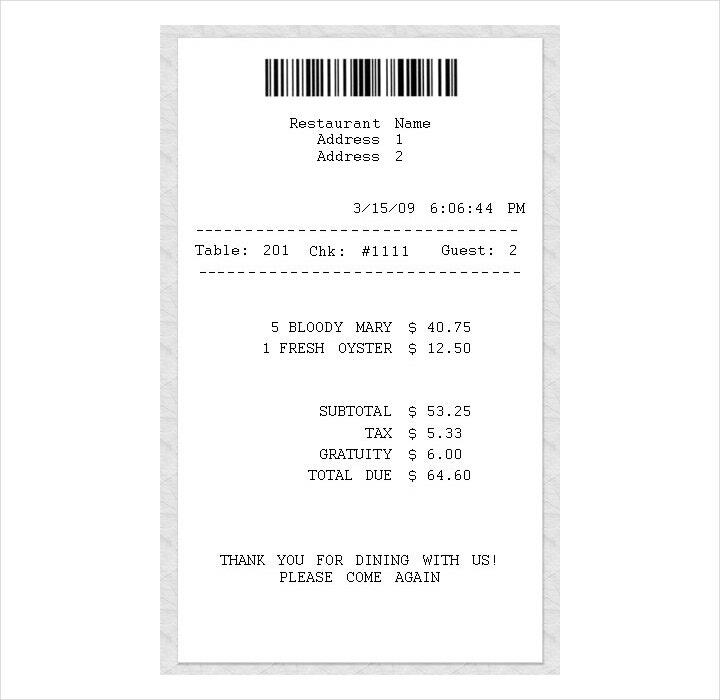 What is in a restaurant receipt template? 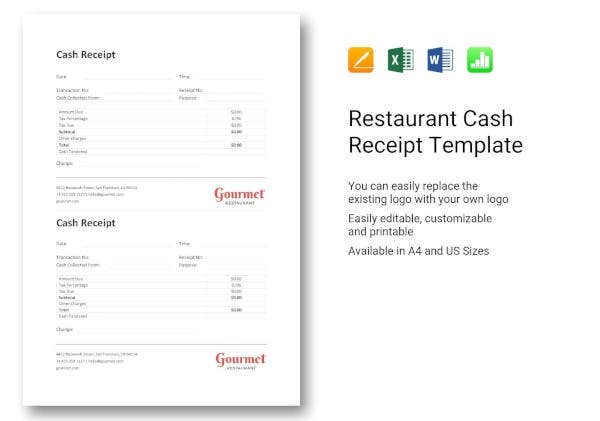 Most restaurant receipt templates nowadays follow a certain degree of visual decoration primarily for the purpose of further branding and advertising their establishment as well as making the establishment itself appear more classy or formal. As you can see from the example above, its simple design is complemented with red curvy decorations to make it appear fancier. It is important to note that additional comments and information at the end of the receipt is an added benefit to your receipt mainly because you can include additional information as well as advertise a few more things (be it new products, store openings, promos, etc.) 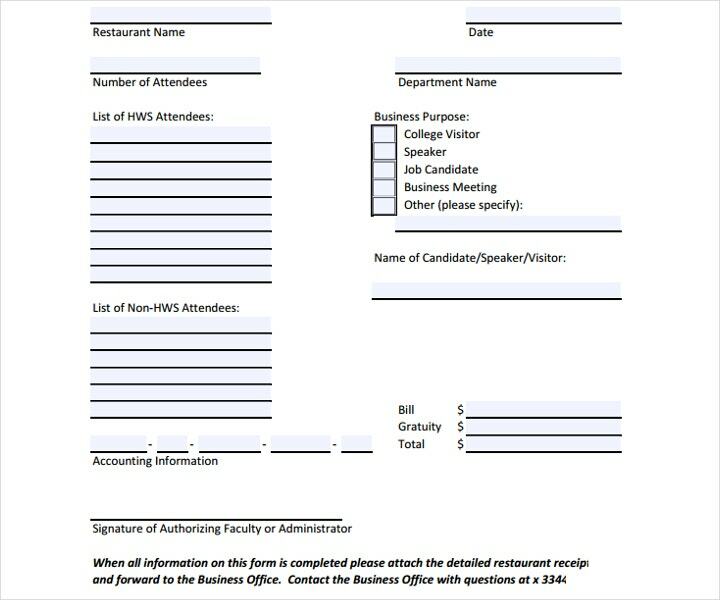 It will also allow you to include information related to your restaurant such as contact information and website links. 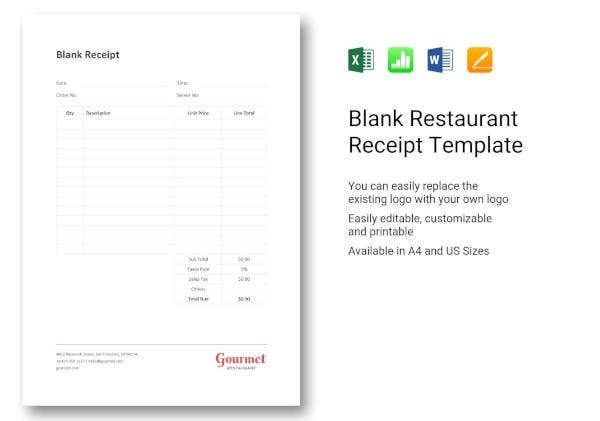 Why use a restaurant receipt template? 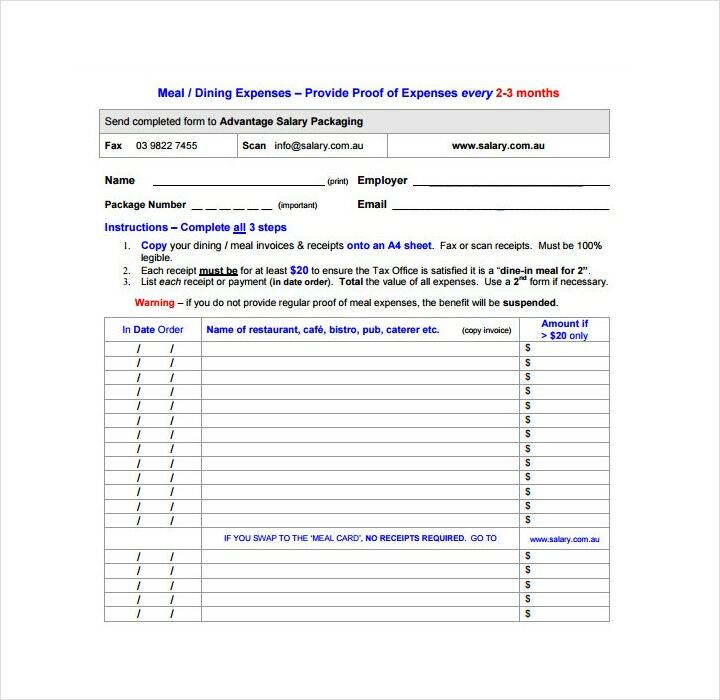 You may wonder why it would be more beneficial to use a restaurant receipt template as opposed to making one from scratch. Well, the answer to that question is rather quite simple. 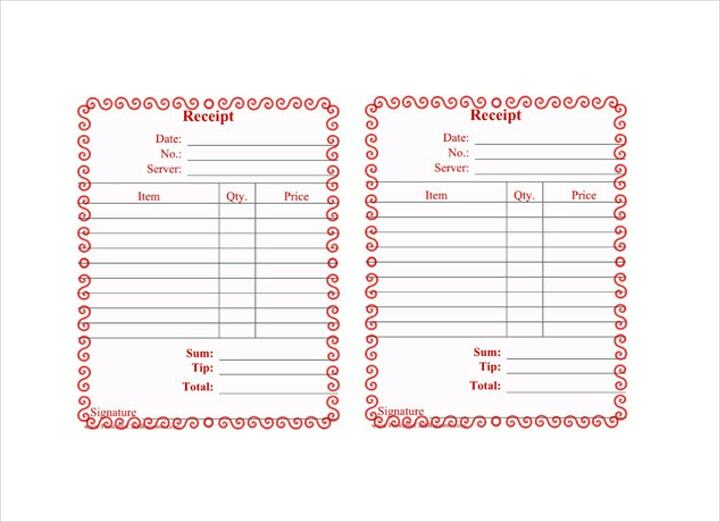 You see, when you use a restaurant receipt template not only do you save time in writing the receipt, but you are also introduced to well-made and decorated themes for your receipt. In fact, most studies suggest that people are more likely to keep a rather decorated receipt for the appearance alone which indirectly ensures that the person who has the receipt will also keep the receipt for later reasons. 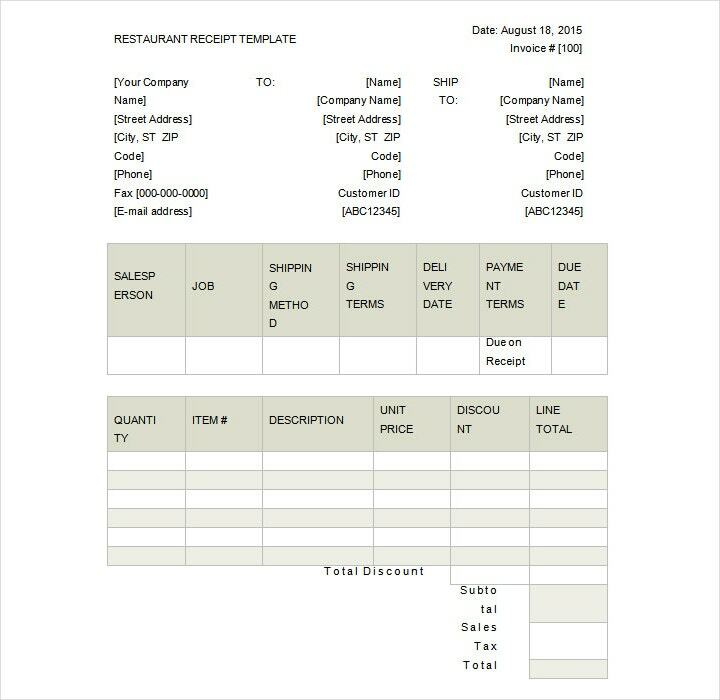 An itemized restaurant receipt template is a type of receipt template that follows a simple and straightforward format which is sometimes the preferred choice in some restaurant establishments. 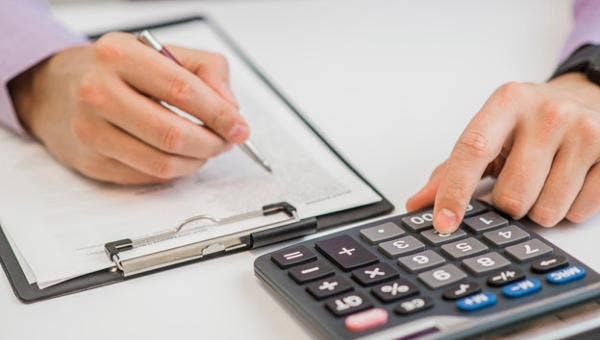 It follows the format of listing the date of the transaction, the name of the vendor, the item being purchased, and, of course, the cost of the items. 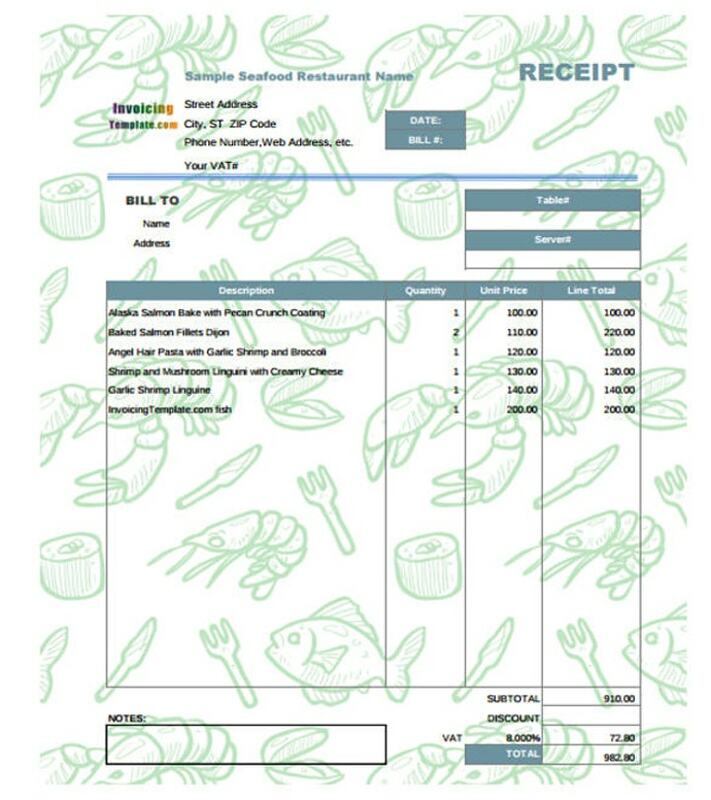 A restaurant dining invoice receipt is a type of receipt template that follows an almost accounting-like format as you can see from the sample above. It allows for the means of easily cataloging every item that will be included in the transaction in order to arrive at an estimated total cost subtracted by any current promotions or discount. This makes it easier to calculate the actual amount needed to be paid by the customer to the cashier. Overall it could be stated that having a receipt for every transaction is important regardless of the nature of its products. 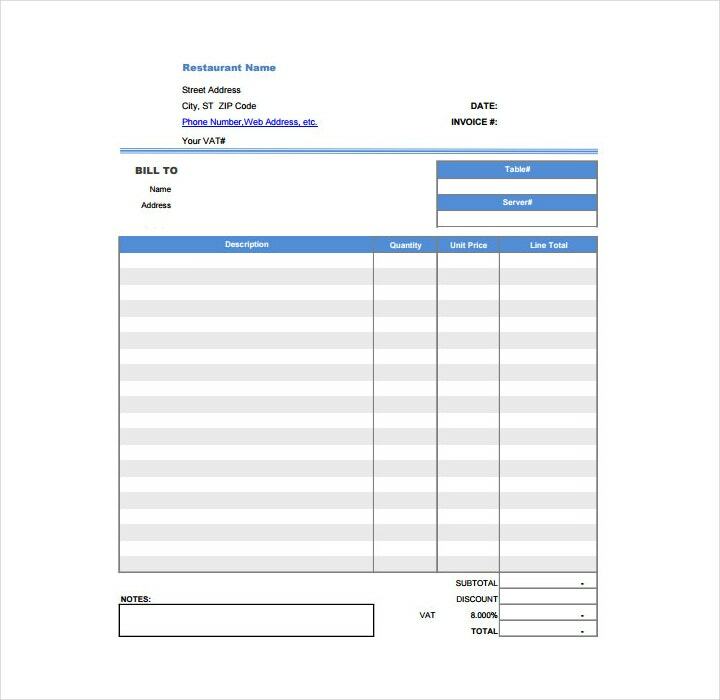 Whether it a restaurant receipt template, a lease receipt template, or any form of receipt template, the function is always similar; list down the items involved in a certain transaction for future reference as well as identify fair trade and transfer of ownership to a certain degree.